Make this dynamite Leopard footwear part of your wardrobe, and you will definitely walk in the wild side! 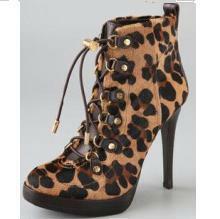 These leopard-print haircalf platform booties by Tory Burch, feature a drawstring pull at the lace-up closure. Contrast leather tongue and contrast leather trim at heel cap. Seam detailing. 3/4″ (20 mm) stacked platform and 4.75″ (120 mm) stacked stiletto heel. 4″ (10 cm) shaft. Leather sole.